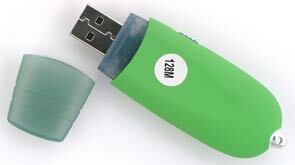 Today we have three USB 2.0 flash drives - as many as USB 1.1 models. In contrast to the previously tested drives, these ones use one controller instead of a tandem of two chips employed in three drives reviewed before. More progressive are getting more in number. On the other hand, an ordinary user is not interested much in the architectural peculiarities - what matters is how all that stuff works. But first of all, let's have a closer look at the contestants. The example of the Black Pearl mainboards perfectly shows how dashingly the prices are falling: if the CUSL2 came earlier with a screwdriver, now the the P4PE Black Pearl goes with a 32MB flash drive. It's not much but still, it's a good replacement of diskettes. This model doesn't sell separately, but its package is good, - it comes in a separate cardboard box. Beside the drive there is a USB extender, a neck strap and a brief driver installation instruction. The device looks unusual because it's made of translucent plastic through which all the filling is well seen. 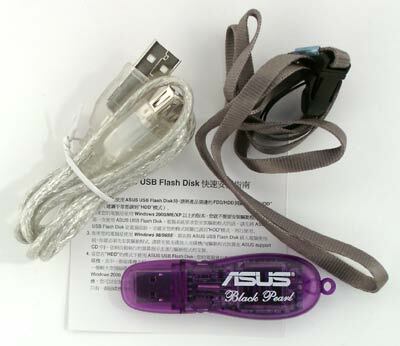 In other respects, it looks similar to the previous ASUS flash drive. I wish it had a belt clip as well. As a rule, all flash drives work as removable discs. This one is exception: a part of it of 1.2 MB (like a 5.25" high-density diskette) works as a drive, and the other part as discs. What was it done for? It's simple: only the Windows 98 is able to format any storage device as a system one. The Windows ME supports only diskettes in this respect. The Windows XP can easily create a system diskette but needs a special program and a bootable diskette image to make a bootable flash drive. Drive makers solve this problem differently, but ASUS's solution looks very elegant: instead of conquering the consequences the company has eliminated the cause. Since the system sees a part of the drive as a diskette, it works with this drive as with a diskette. No special software is needed in this case. Besides, the computer boots from the drive as from a USB-FDD, which is supported by much more mainboards (especially, in notebooks) as compared to booting from USB-ZIP (it's needed for all other drives except Transcend JetFlashA). The disadvantage of this solution is that the free space is divided into two parts when booting is rejected. But, it's not a big problem. Another downside is that the booting area is just a bit over 1MB, i.e. you can't record much on such system diskette. It's worse, but it's needed not that often. Unfortunately, there is no any password protection. The only protection is ensured by the respective slider :) However, normal booting for a Phison based drive is a big step forward. Since the way of the USB 2.0 interface into the market is not that easy, the manufacturers keep on updating their classical line. Actually, by now I expected the Pen Drive 2.0 from Digitex. But there must be a problem (or the company doesn't hurry and prefers to wait until all problems are solved), and what they offer today is the Container with the good old USB 1.1 interface. This model is based on the OTi controller. According to the instruction, the line varies from 32 MB to 1 GB (according to the box, the line is shorter: 64-512 MB), like in other lines. The accessory pack is standard: drive, USB extender, 3.5" CD with software and documentation, neck strap and instruction in 4 languages. Since there is nothing to change inside, the distinguishing feature is its design. Two colors (blue and green) plus two gradations (dark and light) results into 4 variants of the cover design. It distinguishes the Container from almost all other drives, except the Kingmax. But the Kingmax UFD has rather a woman design while the Digitex Container follows the youth-sports style judging by the shape and rubber plastic that protects the drive from damages. The drive itself is wide but thin: 83 x 27 x 14 mm at the weight of 15 g. Well, the companies are trying to embrace all user categories offering a unique design for each. Today the drive makers mostly update their old lines. But not all drives coming onto the scene these days belong to this group - you can see new names in this sector since it looks really attractive. For example, Eline. The drive itself is compact (75 x 23 x 10 mm) though it can't be considered ultra-slim. Like most other drives, it has a write protection slider, a LED and a neck strap eye. Unfortunately, there is no a belt clip. The box contents is ordinary: USB extender, brief instruction, neck strap and CD with software. The drive can vary from 32MB to 2GB. 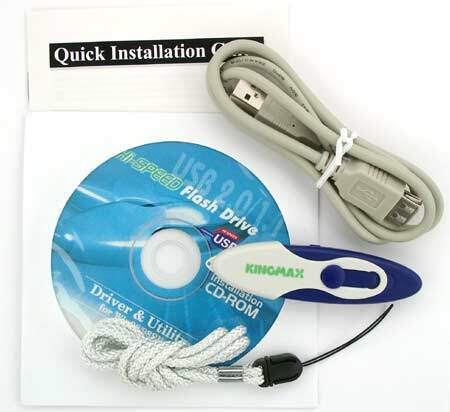 Kingmax was one of the last to offer its USB 1.1 drives but in the front line to launch USB 2.0 drives. 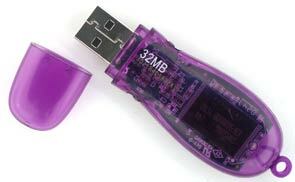 It's not just a flash drive with the USB 2.0 interface - this is something new. If you remember, all three drives tested before were built on the NEC+Phison tandem, and they performed similar to each other. Now we have only one Prolific chip controller. Such scheme - controller chip + memory chip (or two) - was appeared in the first flash drives and was then utilized during two years. First drives designed for USB 2.0 were more complicated because controller makers couldn't or didn't want to make a quick transition to the new interface, and the market strove for high-speed devices. At the same time Phison (and some others) had ATAPI-flash bridges, and NEC had USB 2.0-ATAPI ones. Hence hybrid devices with the price and other parameters being rather poor. Now we can witness the real turn toward the USB 2.0. The design looks interesting. You can't remove the cap, you can only move it forward, turn around its axis and then put on the rear part. On one hand, you will never lose it, but on the other hand, I think that unreliable rivets won't live long. The dimensions are standard - approx. 90 x 24 x 14 mm (we measured it ourselves); the drive weighs 20 g.
Drives based on this controller have recently appeared, but got a lot of negative reviews already. First of all, the compatibility is poorly realized especially with the USB 1.1 controllers. I don't know why it is so, and what is the controller's design if a USB hub is also indicated. I do not have problems with the Prolific's drive but let's wait for the results. Luwen has developed a USB 2.0 model as well. The design of both the drive and box is changed, but the accessory pack is inherited from the previous models. 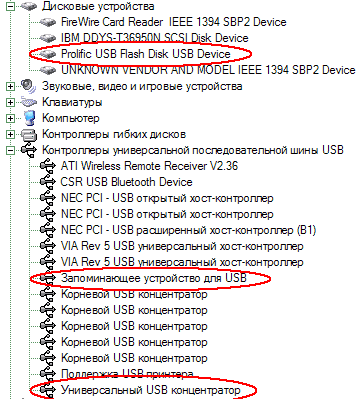 In case of EasyDisk, you will see the same line in the list of devices irrespective of what controller is used. 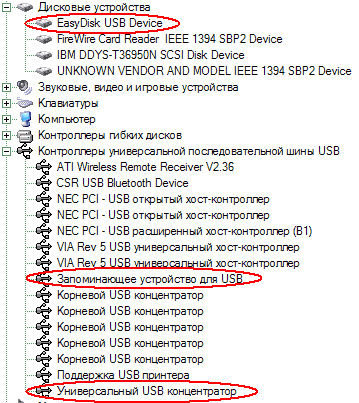 There is an error this time - the "Universal USB Hub" makes the system think that this is a model based on the Prolific (like in case of the Kingmax) with all consequences. The drive looks good since it's thin enough but there can be problems with connection because it is rather wide - 82 x 29 x 9 mm according to my ruler. The weight is 15 g. The belt clip is unfortunately lacking. Like Kingmax and Luwen drives, this is also a second-wave flash drive with the USB 2.0 interface the design of which looks like a classical model - the board carries only the Phison's chip (instead of the NEC+Phison cocktail) with a few components around. Samsung's flash memory chip is located on the additional card that is connected to the mainboard (the card also has space for a second similar chip). That is why memory size is not a problem for this company - mainboards do not depend on it, and it's much simpler and quicker to make additional cards. 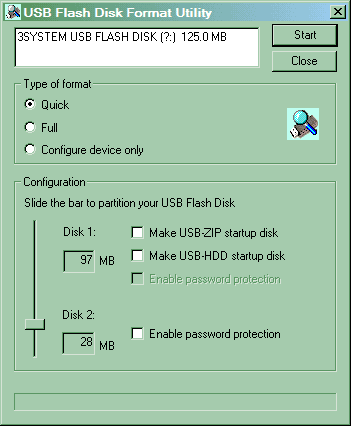 There is no software at all: first of all, it is USB 2.0, and secondly Phison is not OTi or SSS which first launched utilities for data password protection and then user-friendly software to make drives bootable under any Windows systems, not just under Windows 98. The only exception in the Phison line is the above ASUS, but it uses another approach (though it solves the problem in 90% cases). There is no even a simple advanced formatter, that is why if something happens only the Service can help. The drive is thick but short: 77 x 28 x 9 mm. With the clip the device gets even thicker. But you can't remove it because there is a single bolt that joins all the parts and the clip together. It weighs 20 g. Two extenders are supplied: a usual cable and a travel 5cm one. However, I would prefer a dock station like of the Hyper Drive/Pen Drive. Also you can find here an elegant neck strap, a brief instruction and a CD with drivers for Windows 98 and a more extensive user guide. All the stuff is packed into a beautiful cardboard box. 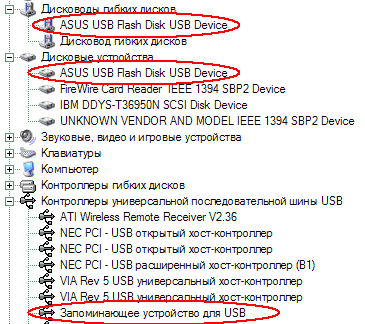 Half of the today's participants do not need the USB 2.0 interface, and the USB 2.0 drives often have to work in the old mode because far not all device support the high-speed bus yet. That is why in the first part I connected the drives to the USB 1.1 port ensured by the VIA8233A. 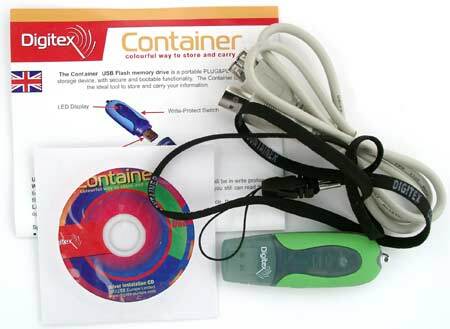 The results of the Digitex Container were expected (far not the first model on this controller). It was also expected that the Eline's drive would have a high access time (thanks to the SSS). ASUS performs well, and all three USB 2.0 drives have broken a new record - I have never seen 3 ms of the drives built on the VIA's controller. Since a single read/write diagram exceeds all reasonable bounds we publish separate ones. The Eline's drive has low scores even in comparison with other drives assembled on this controller. The X-Micro's flash drive is a little behind the other USB 2.0 models. Almost all drives are limited by the bus in the reading mode. Anyway, it's not worth thinking much when choosing among these drives - if you really need high speeds, go with the USB 2.0. Well, it's good they work at all. Now the write speed. The Container traces the most OTi based devices (though it performs better than the previous model, that is why the update was actually useful). 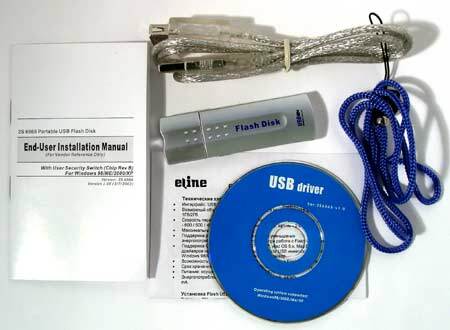 The Eline Flash Disk easily outdoes all the rest on the SSS, except the Transcend JetFlash. ASUS doesn't shine, but we didn't expect more from the Phison's controller. 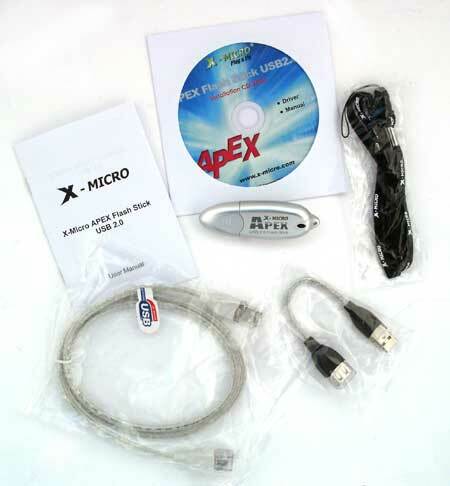 As to the USB 2.0 drives, the Apex Flash Stick makes it up for the lag in the read test - now there is only the 512MB MaxSelect on the OTi's controller that can beat it. Both solutions on the Prolific perform quite badly. It was the same with the card readers - the support of the higher-speed interface doesn't guarantee that the respective model will have high scores in the compatibility mode. 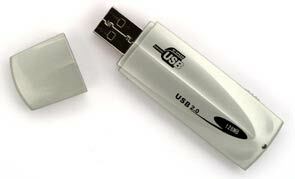 In general, all models work in the USB 1.1 mode, and those designed for USB 2.0 perform equally to the old solutions. 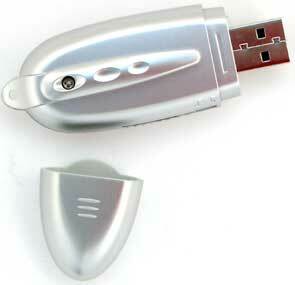 On one hand, we can also consider USB 2.0, but if you need booting, protection etc. such drives won't suite. 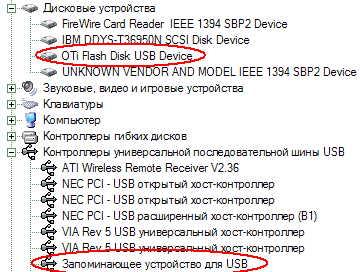 So, if you are going to use exactly USB 1.1, you'd better get the respective flash drive. You can benefit from the advantages of the new models only in the USB2.0 mode of operation. Now we are going to test it. Three models in the pack are considered to be high-speed. Let's connect them to the USB 2.0 port provided by the PCI adapter based on the NEC's chip and start the tests. Well, the NEC itself has a lower access time than the chip integrated into the VIA chipset, and in the 2.0 mode unproductive delays are lower than in the 1.1 mode. The X-Micro drive shows the minimal time, and the other two models go on a par, which proves that they employ the same controller. All three new devices show almost the same read speed which doesn't differ much from the drives we tested before. 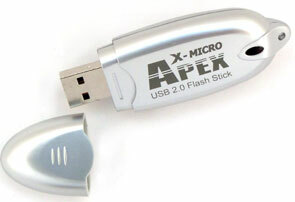 As to recording, the X-Micro proves to be the fastest flash drive in recording operations; its read speed is also good. The Prolific based drives look inferior. Although they work faster than in the compatibility mode, but it's not enough to outpace many USB 1.1 models. And they certainly lose to the other hi-speed drives. So, if you really need a high-speed drive, you'd better go with another USB 2.0 model. And if speed doesn't matter much, have a look at time-proved USB 1.1 drives equipped with powerful service utilities (which are sometimes even faster). Well, one more stage in development of portable drives based on flash memory is behind. The controller makers have finally started producing models with the USB2.0 interface (with a delay of over half a year). However, the poor performance of the Prolific worsens the impression. But I hope the errors will be accounted for, and by autumn the USB 2.0 will be a dominating interface on the flash drive market.